I caught some decent video footage. Steve Elkins and I also shot a few photos. The lighting during this event is "challenging" to say the least. Everything is moving, including the gondola. And then there are all the other spectator boats, so to get good photos or video, a gondolier has to be very good at multi-tasking. 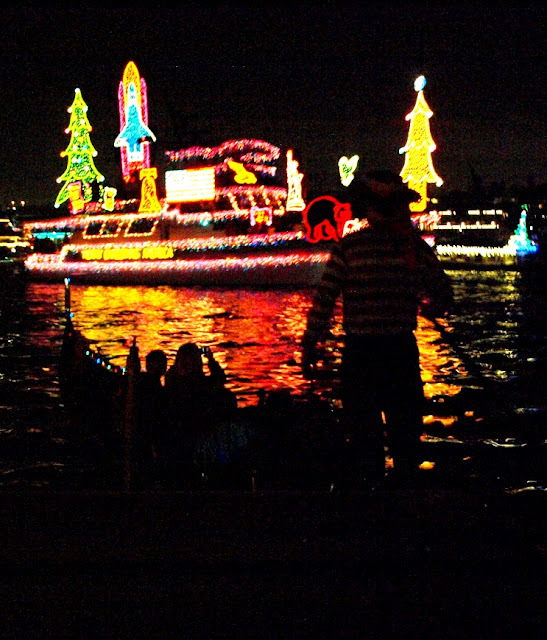 As the parade stacked up this year, the first parade boat, which followed the red Harbor Patrol boat, had an eye-catching light display on the bow that looked like it had been stolen from an alien spacecraft. "Close encounters" of the lead boat. and safety always trumps photography in my book. upon seeing my gondola, feels the irrepressible urge to deliver his best unrehearsed version of a song he's sure all gondoliers sing. The variety of boats is always an interesting aspect of the parade. I didn't get the name, but I was able to shoot both a photo and some video - and this one is better appreciated with video. 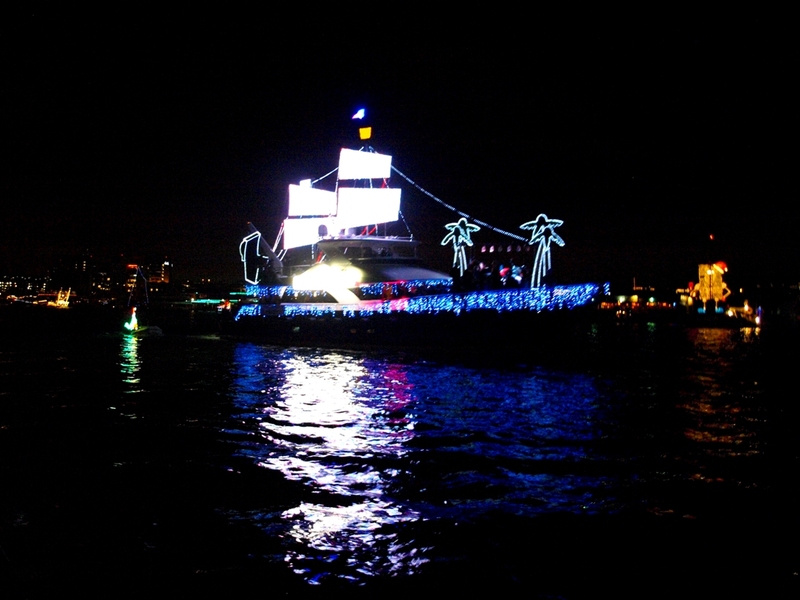 The bright rectangular "sails" changed color and flashed in stripes. Did you catch the crocodile trailing behind at the end of the video? 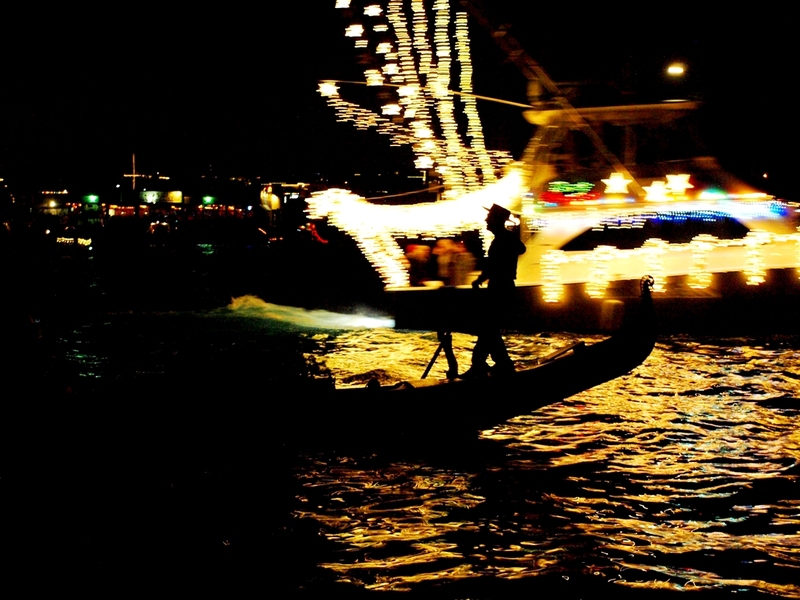 Some of these boats plow by quickly, leaving some nice moto-ondoso for a gondolier to handle. Sure, the parade is supposed to move at a more "leisurely" pace, but there are times when one boat slows down a little, and then decides they need to catch up. That's when it gets dicey. All the parade boats are well lit. 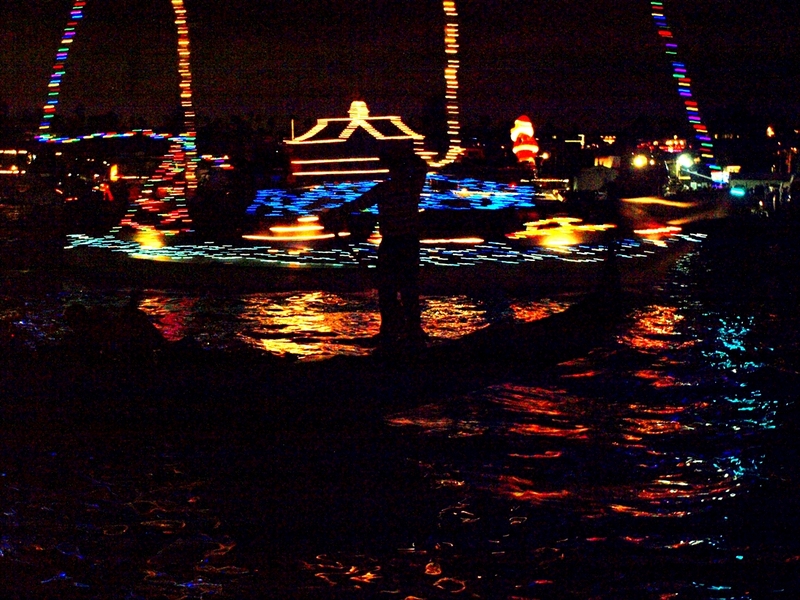 Many of the participating boats have music as well. but when we do, it's usually pretty cool. Some parade boats have obvious themes. I think the Spongebob boat won in their category this year. You don't have to have a huge vessel to make an impression in the parade. Here's one example of someone who worked well with what they had. 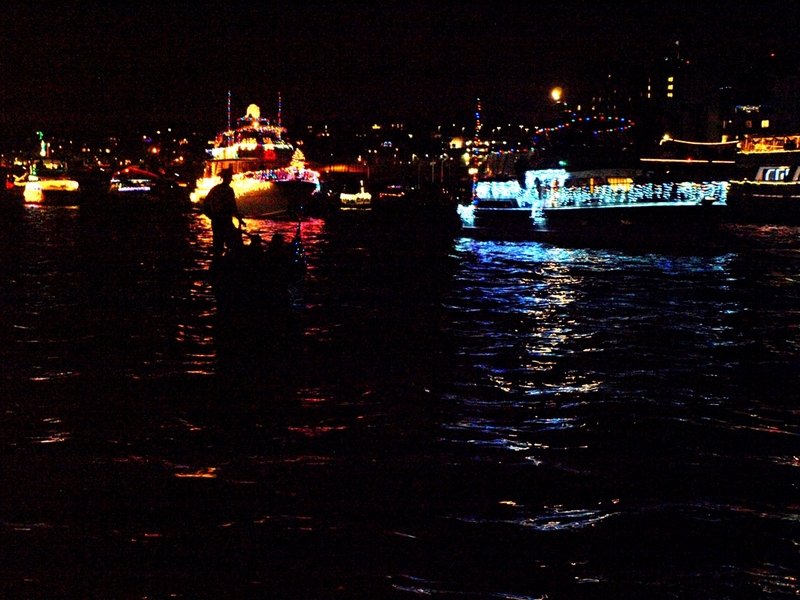 Many of the large fishing boats take part in the procession. (admission is a certain amount per head). In this case folks pay per head to be in the parade. As this one passes by and turns the corner, you can hear her engines well. These boats specialize in open water trips that require a lot more power. but more importantly - for being such a good sport about it. and asked him if he'd take a few shots for me. When he agreed, I proceeded to give him way more directions than he was probably expecting. 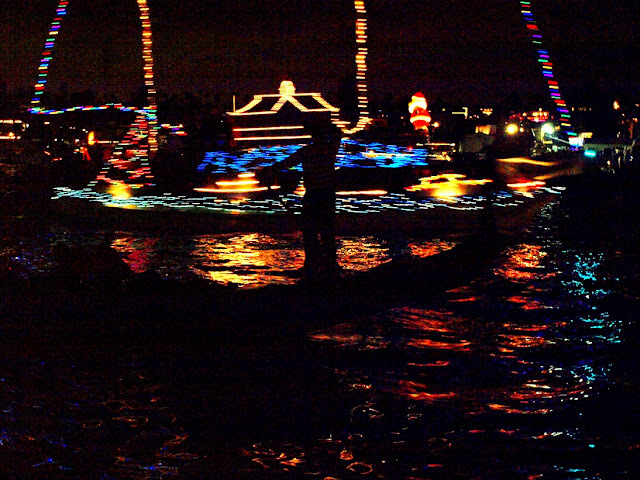 As always, it was exciting to be out on the water for the Christmas Boat Parade this year, and my passengers will all tell you that there's no better way to see it than from a gondola. Not only can you get remarkably close to the procession, but a lot of parade boats see the gondola and speak (or sing) to us over the P.A. system. 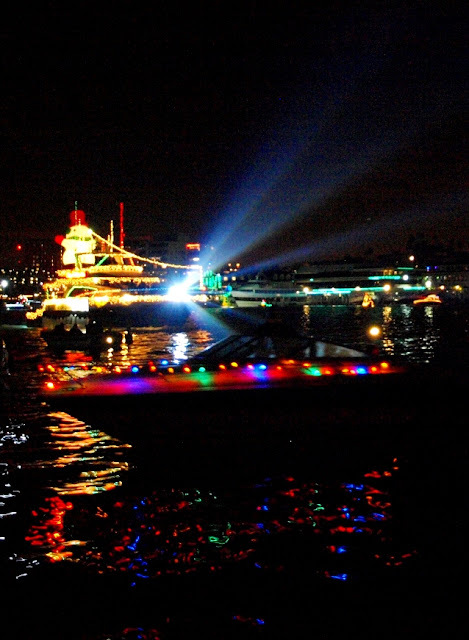 When a fully lit mega-yaght cruises by, with Santa Clause on the bow holding a microphone, and Santa says "Merry Christmas to the folks on the gondola" - well, for my passengers, it's something they'll remember for a long time. Amazing!! nothing else to say. Next year I want to participate. Merry Christmas and Happy 2012 to everybody there. Just the Photo - "Full Moon Over Minnesota"
Just the Photo - "Iron Bridge"